Social media marketing is a fundamental part of any business, and what was once something for the fortunate few have become something that all businesses need, as it helps them reach their business goals, at a low cost. In fact, knowing the potential social media has, reading that 83% of marketers indicate that social media is important for their business, and that is good news because that means many businesses are taking advantage of the huge marketing potential social media has and aren’t missing out on anything. However, many businesses are finding it difficult to measure the results and ROI of their social media efforts, simply because they do not know where to start. And when reading the statistics about the ROI-measuring issue, it’s frightening to see how many businesses are struggling. But that’s exactly the reason I compiled this article, giving you the Top 8 Most Effective Ways to Measure ROI of Social Media. Note that we won’t mention things such sales etc. Only parameters that are measurable ON social media (except for Google Analytics), because these are what ultimately leads to a conversion. The number of link clicks reflects the quality of your post and how appealing the visual is. Certainly, if you’re using social media effectively, you will get website clicks all the time, but if you share a strong and appealing post, you might be able to see if your website clicks have peaked a little. If you got a large number of clicks with little engagement, it means that something caught their attention, which made them click the link to find out more. However, if you didn’t get good engagement on that post, it might mean that your post wasn’t appealing enough to engage with. And, it might mean that the bounce rate of the link was very high. With Google Analytics, you can track different traffic sources to your website to see how you’re performing. Also, many platforms offer the ability to see how many people have clicked the link in your bio or in your post. 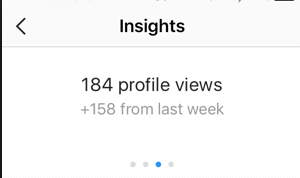 Instagram Insights is one example where you can see just how many people have clicked the link in your bio during the week. The more likes you receive, the more appealing your post is to people (unless you buy fake likes). By seeing how many likes you get per post and comparing them, you can see how many people it impacted to the point where they would like the image. If the post they liked was a marketing post of your product, they might just have become aware of your brand, increasing the chances of them buying something in the future. These days, a like isn’t equivalent to the impact a like was back in the days. Today, because of all the content and the constant scrolling on social media, a like is now often a passive, mindless action. Likes are good and you definitely want them, but sharing is a conscious decision. When someone shares your post (or retweets, re-vines, etc.) they are giving a personal recommendation to their friends, colleagues, and family. Because of this, shares are a great indication of the quality of your work. 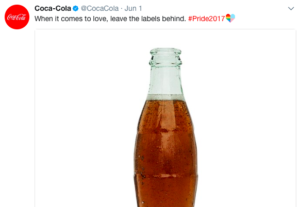 When Coca-Cola shared a very interesting and appreciated Tweet during pride, they received more retweeets than usual, and this is a sign that people liked that Coke stood up for gender equality. Of course, likes are good, but they might not be the best way to measure ROI and the impact your post has on your audience.Likes are good and you definitely want them, but sharing is a conscious decision. Sharing, on the other hand, is a completely different ball game. When someone shares your content, it’s a conscious decision, and evidence that they liked your content a lot. The best part is that when someone shares your content, the statistics are very friendly. In fact, 92% of Consumers Trust Peer Recommendations Over Advertising. So getting a share might not only mean that you impact 1 person (the sharer) but probably a lot more. The repost will probably also make them aware of your brand, which is the first step to new customers. Therefore, social shares can be a great valuable ROI-measuring factor. Social media is supposed to go both ways. Someone posts something, and others leave their thoughts on it. That’s what social comments are all about. Especially for brands. No matter if you face criticism, compliments or questions in your comments, you should value them all because not only are they helping you improve your marketing and tweak your strategy, but they are also an indication on what results you are generating with social media are all helpful for improving your marketing, but silence is not. Getting comments on your comments is a reliable sign that your content is hitting all the right points of interest. For example, there are a few comments that are not too uncommon for brands to receive on social media that can help them better understand the ROI they’re getting from social media.are all helpful for improving your marketing, but silence is not. Getting comments on your comments is a reliable sign that your content is hitting all the right points of interest. Getting comments on your comments is a reliable sign that your content is hitting all the right points of interest. The first comment is the type of comment all brands want, which shows a direct result of your social media efforts, in the form of the customer buying something from you. Secondly, the other two shows that you impacted your audience in a way where they are potential buyers in the near future. Simply continue engaging with them in the future and them becoming customers is almost a certainty. When you receive these types of comments, it makes it easy for you to understand how you are impacting your audience and if you’re making any direct sales from your social media efforts. Tags OR mentions shows that people are talking about your brand even when you’re not in the room, and that’s extremely valuable. This shows that the ROI of your social media efforts (among other) has been that you create a broader brand awareness and interest in your brand, which ultimately will lead to sales. This is another social media KPI that really focuses on your relevance because it shows that you are maintaining top-of-mind awareness. Not all social media platforms offer this metric, but if you have access to it, why not use it? Not all social media platforms will provide this metric, but if it’s there, it’s worth your attention. Many social media websites are used as search engines for brand research today. There will be plenty of people who follow you, but they may never visit your profile. Social media platforms are today used as search engines for when people are doing brand research, which means that people will be following you, but never have a real reason to visit your profile. However, the people who have just found your business certainly will. Although this measuring metric isn’t as important nor relevant as the others, because you can’t measure impact or intention to buy, however, profile visits shows the overall interest in your brand on social media, way beyond the latest post you have done. This is probably the biggest and most important ROI-measuring information that will tell you a lot about your social media efforts. How much website traffic are you receiving from social media? If you’ve run a campaign on social media with a specific discount code, for example, it’s easy to trace what sales came from where, so if you’ve done so, you can easily see that those sales came from social media. If you aren’t using the tactic of providing your followers with social media specific discount codes, it might be a good idea to begin doing so, as you’ll be able to instantly see if you’re driving any sales from there. If you’re investing a good amount of time and effort into your social media content, you’ll want to make sure that this number reflects that. To learn more about the traffic that goes to your site, Google Analytics is the best choice. 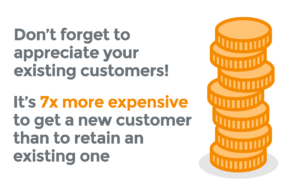 Of course, the ultimate ROI-measuring is the number of customers you’ve gained through social media. If you’ve followed the rule of not making your social media posts too promotive and instead focused on providing value to your target audience, you will get chances to ask for something in return after a while. If you’ve been able to accumulate followers, more correctly the right followers and engaged with them, they have probably become very loyal to your brand. But have they come to the finish yet? The best way to drive sales on social media is to engage with them so they become customers, and then keep them loyal so they become lifelong customers of your brand. 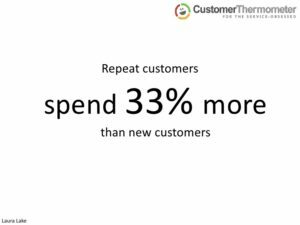 You know what they say: the best customers are the ones who return time and time over. And there are statistics that prove that. The definition of an active follower is considered to be someone who has engaged with your brand on social media within the past 30 days. If you’ve been working with social media for a while, you’ve probably gotten a few very loyal followers. And as you might know, they are extremely valuable. Learn more about what made them become that loyal to your brand by simply asking them. This type of information is extremely valuable as you can learn what kind of social media efforts gives the ROI of a super loyal follower. It maybe goes without saying but loyal fans are immensely important for your brand because they are very likely to recommend your brand to their peers. And thinking about the statistic mentioned above about peer recommendations, it seems very relevant and important to get a lot of loyal fans.